Prayers by the Chaplain, Rev. 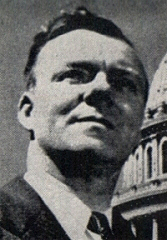 Peter Marshall, D.D. Once again, Our Father, the long weekend that brings rest and refreshment to so many of our people has brought disaster and sorrow to some, and our Nation is sobered in the reflection that death is in the midst of life. Since we know not at what moment the slender thread may be broken for us, teach us to number our days that we may apply our hearts unto wisdom. And may we be compassionate, remembering the hearts that are sore and our brethren who languish in sorrow and affliction. Take from us the selfishness that is unwilling to bear the burdens of others while expecting that others shall help us with ours. Make us so disgusted with our big professions and our little deeds, our fine words and our shabby thoughts, our friendly faces and our cold hearts, that we shall pray sincerely this morning for a new spirit and new attitudes. Then shall our prayers mean something, not alone to ourselves but to our Nation.